1) With market-age birds, on the hottest day of the year, that the maximum difference between the pad and fan ends of a tunnel-ventilated house be 5oF or less. 2) To produce a wind speed of at least 600 ft/min. Of these two design criteria, it is typically air speed which determines the number of tunnel fans installed in a house. As air speeds have increased over the years, not only has the grower’s ability to keep large broilers cool improved, but the higher air exchange rates have, in part, helped to reduce the pad to fan temperature difference from 5oF to between 3 and 4oF. A contributing factor to the improvements in house temperature uniformity is the increasing popularity of well-insulated, totally enclosed houses. The removal of side wall curtains and the installation of ceiling and side wall insulation with double digit R-values have made the amount of heat entering through walls and ceiling essentially inconsequential. 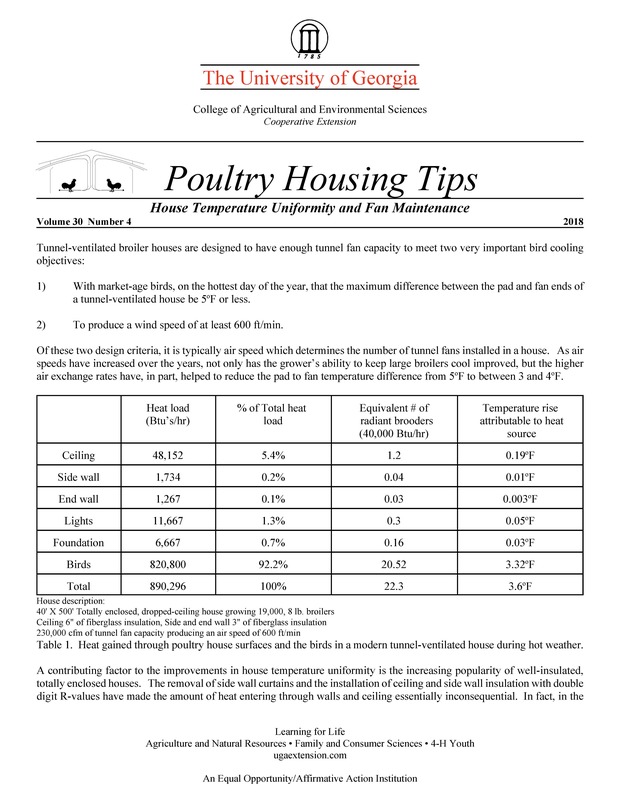 In fact, in the typical modern tunnel-ventilated broiler house the heat entering though walls and ceiling accounts for less than 1/3 of one degree of the temperature difference seen between pad and fan ends of a house (Table 1). Today, it’s the heat we are removing from the birds that is causing the temperature difference between the ends of a tunnel house and has basically nothing to do with heat coming from the walls and ceiling. The heat we are trying to get rid of is already in the house. In fact, it starts off inside the birds. We use air speed to remove the heat from the birds which in turn causes the air moving down the house to heat up. In some ways the temperature difference we see in a tunnel house is a good thing. It is an indicator that we are removing heat from the birds which in turn enables them to continue to eat and grow efficiently. This doesn’t necessarily mean that a large temperature difference is an indicator we are removing a lot of heat from the birds. When we see temperature differences of five degrees or more it more likely an indicator that we have a fan performance issue than an insulation issue. The fact is today our ability to keep our birds cool throughout a house all comes down to installing high-quality tunnel fans and keeping them properly maintained. You could double the amount of insulation in the walls and ceilings and you would decrease average house temperature by about a tenth of a degree. The same could be said about installing exhaust fans in the attic or painting the roof white...it simply doesn’t matter. But, just a 20% increase in tunnel fan capacity would result in a 20% increase in house temperature uniformity and a 20% increase in air speed (ie. 600 vs. 500 ft/min), which could decrease the effective temperature a few degrees on a hot summer afternoon. When it comes to fan maintenance realizing that dust/feather-covered fan shutters and screens are reducing the air moving capacity of a fan is fairly obvious; however, what is not as obvious is when a tunnel fan is not rotating at the optimal speed. At low pressures (i.e. 0.05") when a fan is rotating just 10% slower than it is supposed to, the air moving capacity of the fan is typically reduced between 5 and 10%. But, when the operating pressure is increased, the decrease in fan performance becomes more pronounced. For instance, at a static pressure of 0.15", a fairly typical pressure in many high air speed tunnel houses, the air moving capacity of a tunnel fan can be reduced twice as much to between 10 and 20% when the prop is spinning just 10% slower than it is supposed to. Slow the fan down 20% and at a static pressure of 0.15" or higher, and fan output can be reduced as much as 40%! There are primarily two causes for a fan not rotating at the proper speed: a worn fan belt, and/or a worn fan pulley. A fan belt is designed to ride on its sides in a pulley (Figure 1). As the belt wears, it becomes thinner, and as a result rides lower in the motor pulley. The lower the belt rides in a motor pulley the slower the fan blades will rotate and the less the amount of air moved. In addition, over time the belt moving over the fan motor pulley will cause the pulley to wear. As the pulley wears it acquires a slippery, mirror-like finish (Figure 2) and will become wider, acquire a more “U-shape” (Figure 3) instead of a proper “V-shape.” The wider motor will cause even a brand new belt to ride too low in the motor pulley resulting in reduced fan prop speeds and air moving capacity. A simple way to determine if a belt or pulley is worn through is by examining how the fan belt sits in the motor pulley. Generally speaking, the top of the fan belt should extend slightly above the edge of the fan motor pulley. If it is riding below the top of the motor pulley, either the belt and/or the motor pulley is worn and is in need of replacing. A more precise way of determining the condition of a fan’s belt and pulley is through the use of laser tachometer. A laser tachometer provides a quick and easy way to measure the speed at which a fan prop is rotating. You simply point the laser tachometer at a rotating fan blade and within seconds a “blade count per minute” reading is displayed. To determine fan prop speed, simply divide the blade count reading by the number of fan blades. The proper fan prop speed can be obtained from the fan manufacturer or from independent fan test lab data (bess.illinois.edu). If the measured value is over 5% slower than ideal, it indicates the fan belt should be replaced. If fan prop speed remains too slow after the belt is replaced, the fan motor pulley likely needs to be replaced. Though in the past purchasing a laser tachometer was an expensive proposition (over $200), today there laser tachometers available for less the $20. Though they may be a little trickier to use than the more expensive models, they still can produce accurate results for a price that makes them affordable for practically any poultry producer. Figures 5 and 6 illustrate the use of one of the least expensive laser tachometers (CyberTech* - DT2234A). Standing inside the house, the laser tachometer is held approximately a foot from an open fan shutter, pointing half way between the motor and the fan orifice. The meter typically works best if it is not really bright outside and the meter is tilted slightly downward towards the ground outside the house. When the “test” button is pushed, a stable blade count reading is typically displayed within a few seconds. In this particular case, when the blade count reading of 1,818 is divided by the number of blades (four), it indicates the fan prop is spinning at a speed of 455 rpm (revolutions per minute). When the measured fan prop speed of 455 rpm is divided by the ideal prop speed of 474 rpm (Figure 7 - Fan performance test results published by University of Illinois Bess Laboratory) it can be determined that the fan speed is within 5% of the ideal and therefore the belt and pulley are in an acceptable condition. Had the reading indicated the fan speed was reduced more than five percent, the belt should have been replaced and the fan speed retested. If the fan speed were still too low it could mean that the fan motor pulley is worn and should be replaced. Typically, when this is the case, a visual check of the pulley will typical confirm that the pulley is in fact worn. There are a number of laser tachometers on the market today that can be purchased for less than $100. Checking the speed of your tunnel fans at the beginning of a summer flock will help to determine which fan belts and/or pulleys are in need of maintenance. Replacing worn belts and pulleys at the beginning of a flock will help to ensure that at the end of a the flock maximum temperature uniformity and bird cooling will be obtainable.